How many of you are layered in your scarves, gloves, and boots as you read this? Are you curled up by the fire with an extra hot latte? Sounds pretty unappealing during the summertime, doesn’t it? Just as we don’t want to layer our body with extra clothing this time of year, we don’t want to apply thick, greasy product onto our summer skin. We lovingly push our winter clothes to the back of the closet to make way for bathing suits, sandals, and shorts because we want to be comfortable this time of year. Likewise, we need to do the same with our heavier moisturizers intended for dry, dehydrated winter skin. Summer calls for something lightweight that doesn’t linger. Dip your feet in the pool, pour yourself an iced green tea, and lighten up! If you have oily skin or are prone to breakouts, you’ll want to be especially deliberate in choosing the right summer skincare products. We’ve heard many people echo the sentiment that they know sun protection is important but they just don’t want to deal with the impending breakout that can be associated with lathering up. DON’T ACCEPT IT! You don’t have to choose. With IMAGE’s Prevention + Collection, safety and beauty don’t compromise. You can find the perfect combination of products to keep your skin feeling beautiful and looking great while protecting it from the sun’s powerful UVA/UVB rays. Your skin will thank you from the inside out. 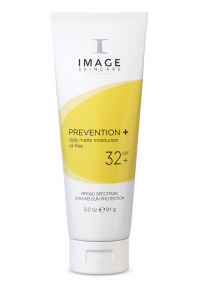 Our Prevention+ Daily Matte Moisturizer SPF 32 utilizes microsponge technology to absorb surface oils and leaves skin with a matte, shine-free finish while providing broad spectrum UVA/UVB protection. The Ultra Sheer Spray SPF 45 sprays on sheer, and then dries clear. When it comes to preventing your skin from acting like an oil slick this time of year, in addition to switching to the right lightweight moisturizer for everyday summer use and applying the right type of sun protection, some people may also choose to skip a product or two in their makeup routine. If you are looking to avoid applying liquid foundation in the warmer weather, another great product to help get you that lighter look is the Prevention + daily tinted moisturizer SPF 30. This oil-free pure physical universal sheer tint can be used as a moisturizer and makeup in one simple step. Ahhh, Summer. The time of year when your healthy, happy skin is the greatest accessory of all. Protect it while looking and feeling your best with our fantastic Prevention+ products.